Investment in and implementation of EGNOS, the European Geostationary Navigation Overlay Service, on Ukrainian territory is the subject of discussions on the international level. In November 2013, the European Commission Ukraine signed a cooperation agreement declaring both sides’ intention to include the Ukrainian territory in the coverage of EGNOS (the European Geostationary Overlay Service). A satellite-based augmentation system (SBAS) providing integrity messages and improved positioning accuracy, EGNOS represents a considerable step in implementation of satellite-based services as primary navigation systems for aircraft. Starting from October 1, 2009, the EGNOS Open Service has provided signal transmission on EGNOS-capable satellite navigation receivers. The EGNOS safety-of-life service became available on March 2, 2011. 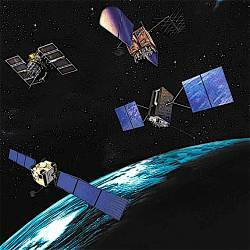 Space-based signals are typically used for safety-critical operations over the territory of western Europe. Possible methods and steps of implementation, potential benefits for Ukrainian users, and other important issues were discussed at an two EGNOS workshops held in Kiev and were an essential part of the Fifth World Congress on Aviation in the XXI-st Century, with the theme “Safety in Aviation and Space Technology,” held in Kiev in 2012. The goal of the experimental work described in this article is the estimation of the quality of EGNOS system performance in Ukraine (in the Kiev area, particularly) after the system was declared available. Introduction of EGNOS in Ukraine will benefit not only the aviation sphere, which is an important part of our national development, but also could be used for monitoring ground traffic, creating efficient agriculture solutions, free and accurate mapping, various maritime uses, and other location-based services. accurate and reliable synchronization with coordinated universal time (UTC). The measurement facilities of the EGNOS ground segment are known as RIMSs (ranging and integrity monitoring stations), which send raw data streams to the central processing facilities of the EGNOS Mission Control Center. The active RIMSs nearest to Ukraine are located in Warsaw (Poland), Sofia (Bulgaria) and Golbasi (Turkey). Our experimental research consists of receiving GPS data and corrections transmitted over geostationary satellites used by EGNOS. We processed the experimental data using PEGASUS software (Prototype EGNOS and GBAS Analysis System Using SAPPHIRE) developed by the GNSS Tools Team at the Eurocontrol Experimental Center. Based on the results, we will draw conclusions at to whether the characteristics of the navigational system fit the safety requirements of aviation users in the Ukraine region. The receiving station is located on the roof of the eleventh wing of National Aviation University (NAU). The coordinates of the receiving station were surveyed to five-centimeter accuracy and are considered as the primary reference point for our investigations. Figure 1 (see inset photo, above right, for all figures and tables) shows a screenshot of the monitor at our receiving station. On the screen, one can see the location and status of GPS and Galileo satellites, as well as two Inmarsat geostationary (GEO) satellites that have EGNOS transponders on board, which transmit messages with corrections. The GEO satellites, which transmit the messages with EGNOS corrections, appear as hexagonal icons in the left-hand panel of the screenshot and are identified by their pseudorandom noise code (PRN) numbers 120 (Inmarsat 3F2 AOR) and 126 (Inmarsat 3F2 IND-W). GLONASS satellites also appear in the figure, but the EGNOS system does not use these and, therefore, they are not considered as the part of the experiment. overall availability of service — measured as the availability of signals meeting the requirements for instrumented approaches with vertical guidance (APV) APV-1, APV-2, and Category 1 (CAT-1) precision approaches to runways. Our experiments began in 2008, even before EGNOS’s official launch, and ran up to 2014. In this article, we will use the results of research conducted on November 24, 2014, to provide an example of our experimental program’s findings. Figure 2 depicts the accuracy achieved in the horizontal plane displayed as north-south and east-west deviations from the primary reference point. It is calculated as the difference between measured position and the actual coordinates of the receiving station. Data come from static receiver tests and were collected at the NAU during a period lasting 5 hours and 14 minutes, with 18,475 out of 18,846 received epochs considered valid EGNOS solutions. Figure 3 depicts a map of the availability of ionospheric pierce points (IPPs). Availability indicates how many satellites that use the given IPP received ionospheric corrections from a EGNOS geostationary satellite. Only those satellites that received ionospheric corrections should be used in an EGNOS solution. Because some of the GNSS satellites visible from our antenna don’t receive EGNOS corrections they cannot be used in an EGNOS solution. The coordinates of Kiev are 30° 30’ E 50° 27’ N. Availability of IPPs in this area was approximately 50 percent. Availability of pierce points was 90–100 percent for satellites to the west, decreasing somewhat to the south and north, and falling rapidly to 40–50 percent for satellites to the east. Integrity is a measure of the trust that can be placed in the correctness of the information supplied by the total system and includes the ability of a system to provide timely and valid warnings to the user (alerts) when the system must not be used for the intended operation (or phase of flight). EGNOS broadcasts an integrity signal giving users the capability of calculating a confidence interval, alerting them when a GPS satellite malfunctions and is not to be used for a safety-of-life application. The data produced and transmitted by EGNOS thus include estimates of GPS satellite orbit and clock errors and estimates of errors due to GPS signals passing through the ionosphere. The alert limit (AL) is a fixed threshold corresponding to a type of operation. The mechanism to trigger an integrity alert compares, for each epoch, a (conservative) estimate of the position accuracy in relation to the alert limit. This estimate, called the protection level (PL), is computed based on quality estimates provided by the SBAS system and tropospheric, ionospheric, and SARPS variance models embedded in the receiver software. The PL provides an indication of error uncertainty modeled by the variance of a zero-mean normal distribution that describes user differential range errors, user ionospheric range error, aircraft pseudorange errors due to multipath, and residual pseudorange errors from a tropospheric model. An integrity event is an epoch in which the position error (PE) exceeds a maximum allowable alert limit, while no alert is generated within an allowable time period, called the Time to Alert (TTA). A misleading information (MI) event is considered as every epoch in which PE is greater than the PL, which can be regarded as reflecting a system anomaly. Hazardously misleading information (HMI) is defined as every epoch where the position error is greater than the alert limit and the protection level, which represents an anomaly and can be hazardous for users. HMI thus means that the epoch is actually unavailable but would have been labeled as a valid one in flight. (Note that ALs can differ for various types of users/operations.) In HMI situations the actual position error is greater than the alert limit (PE>AL) and the alert limit is larger than the protection level (AL>PL) but the epoch still passed as valid for this operation because the protection level was estimated incorrectly. A near-MI event is defined as every epoch where PE/PL > 0.75. During flight only the protection level can be calculated, as an aircraft’s true position is unknown, therefore we cannot calculate position errors. In PEGASUS, accuracy is divided into measured and scaled. Measured accuracy is defined as a 95 percentile of the error distribution of all the valid samples within the assessed period. Scaled accuracy is defined as 95 percentile of the error distribution of all the valid samples scaled with an alert limit (XAL)/protection level (XPL) ratio. Here, X means a horizontal or vertical plane, the alert limit is defined by the specific flight operation, and the protection level is defined for each sample. where i is the number of samples, AL is defined for each kind of operation by ICAO, and PL is based on estimates made for a current epoch. Data is scaled to the worst-case geometry in order to eliminate the variability in system accuracy that is caused by the geometry of the orbiting satellites. Theoretically the error statistics should only be based on the samples during which the service level was available, that is, the horizontal and vertical protection levels must be less than the horizontal and vertical alert limits (HPL<HAL and VPL<VAL). This will result in a different number of samples for each type of procedure, as the alert limit will differ for each type of procedure. Our experiment results showed that the horizontal measured accuracy at NAU in the APV-1 category is 3.32 meters and the vertical measured accuracy is 1.73 meters. The horizontal measured accuracy results for APV-2 category is 2.82 meters and the vertical measured accuracy is 1.62 meters. The scaled accuracy for APV-1 is equal to 8.35 meters and 5.28 meters for horizontal and vertical planes, respectively, and the scaled accuracy for APV-2 equals 8.86 meters and 2.18 meters, respectively. These results were well inside the accuracy requirements for meeting International Civil Aviation Organization (ICAO) standards and recommended practices (SARPs) for integrity operations aircraft approach and landing operations as given in Table 1. To summarize the integrity information generated by our research, we used the format developed by Stanford University to characterize performance of the U.S. Wide Area Augmentation System (WAAS). The measurements that correspond to typical operations of APV-1, APV-2, and CAT-1 for horizontal and vertical planes are shown on Figure 4 and Figure 5. On the horizontal axes, precision errors are plotted for horizontal (hpe) and vertical (vpe) planes; on the vertical axes we have alarm limits for horizontal (hpl) and vertical planes (vpl), respectfully. The color scale allows us to calculate the number of points (therefore the number of epochs) that meet — or, conversely, fail to meet — the required performance for various approach and landing procedures. All epochs that meet a stricter standard will satisfy a lower standard. For example, all epochs that meet APV-2 requirements will satisfy APV-1, too. For 18,475 valid epochs in the horizontal plane (Figure 4), all of them were fit for safety-critical operations. From 18,475 valid epochs on the vertical plane (Figure 5) 8,159 epochs met only APV-1 requirements, 10,289 met those for APV-2, and 27 epochs satisfied CAT-1. Such figures can only be built based on observations made on the ground, as we have no position errors information during the flight. There were no integrity concerns and therefore we may conclude that EGNOS is safe to use from the integrity point. The most problematic parameter for Ukraine is continuity of service, which in turn affects the availability and reliability of service. Continuity of service refers to the capability of the navigation system to provide a navigation output within the required integrity parameters during a given period. In practical terms, a continuity event occurs either due to the inability of a receiver to output a position solution or because the system generates an alert not to use the provided position solution. This alert is normally generated based on the vertical or horizontal protection level (XPL) exceeding a corresponding predefined alert limit (XAL). In our experimental tests, no discontinuity of service events occurred for position solutions and APV-1. Table 2 lists the discontinuity events for APV-2. The service availability of an SBAS system is defined as the ratio of the number of samples that are available for a given operation to the total number of valid samples. In this research we have received 100 percent availability for APV-1 category but only 55.838 percent availability for APV-2, with negligible availability for CAT-1, 0.146 percent. These are extremely good results compared to previous years and indicate improvement of EGNOS from approximately 40 percent availability for APV-1 in 2009, 70 percent availability in 2011, and 80 percent availability in 2013. As we are primarily interested in APV-1 results, the positive changes are evident. Even with the absence of a RIMS station on the territory of Ukraine, the reliability and effectiveness of EGNOS has significantly changed over the years. Nevertheless, the good availability of positioning for the APV-1 category does not guarantee EGNOS use on the territory of Ukraine. Without proper equipment and infrastructure, EGNOS is unavailable for safety-critical operations. Still it is available for other non-critical applications such as agriculture or mapping.